Personal branding is the way to stand out of the crowd and being noticed in some special way in the business world which makes you unique. It is your value proposition for the future of your career. In a session at the webinale09 I held a speech about ‘Career 3.0 – split between personal branding and productivity’ and gave some projections on the relevance of social media activities and how these affect your career development. Today, we want to learn from Dwight Cribb, founder of his successful recruitment agency, what professional recruiters think about personal branding and what is the relevance for personal branding. You can follow his offline and online thoughts via his Twitter account. Q: What is the first thing you do when somebody is being suggested as a perfect candidate? Dwight Cribb Of course I will first probe what the relationship between the candidate and the person suggesting him is. Supposing that the recommendation is made during a phone conversation, I will in parallel check the candidate’s profile on Xing. If that does not provide the information I require I will probe deeper with people search engines. Q: Let’s imagine somebody is not doing anything for personal branding. This person is not blogging, micro-blogging or social networking. Does this have a positive or negative impact on your perception of that person? Dwight Cribb This largely depends on the type of position I am recruiting for, both in terms of seniority and discipline. I would normally expect someone in a directly client facing role or someone who communicates directly on behalf of a division or company to have at least some presence on the web. It is, however, true that not being on a social networking site is today more of statement than being on one. A few years ago one could be forgiven for thinking of people who had not yet discovered Xing, LinkedIn and facebook as being somewhat backward or conservative. As it is today largely impossible to not have noticed these networks flourish, we must assume that those not on them have shunned them on purpose. This may be a good strategy if one relies on others to communicate with clients and the public, especially as a senior manager. A C-Level executive will through his utterances on social networks have a severe impact on the brand communication, it thus needs to be 100% in line with the other communication, if not it will cause at best confusion and at worst it will undermine the credibility of the brand. As for blogging, I think that is a very personal decision and I would never think badly of anyone who did not blog. I may, however, think badly of someone who blogs badly or in a manner inappropriate to his or her position. So overall it would not reflect badly if I found out nothing about a person online, it would just peak my interest and make me more curious to receive other information in the form of a CV or a recommendation from a third party. Q: Will personal branding and the individual online reputation replace the traditional CV some day? Dwight Cribb I doubt whether it will replace the CV, it is more likely that it will continue to augment the CV. Online reputation is a fantasy product. We each spin our profiles in a manner which we feel supports the image we want to convey. It is self marketing. A CV is more strongly based in chronological fact and provides a picture which comes closer to the reality than the pictures which get drawn in communities. Q: If everybody has a strong personal brand, don’t companies fear these people could get chased by some competitor and recruiters? Or that employees just work for their own career purpose? Dwight Cribb Most successful employees work for the own career advancement. But in the long term they will only achieve this by delivering results to their employers, because people are very good at spotting meaningless self marketing and will not fall for it for long. Good employees have always had a strong personal brand (also called reputation). It has been true in all areas and across the ages, if you do something well you will be admired by your peers and your reputation will spread. This means that others will try and employ your services, sometimes via a recruiter. Q: What is your advice on how companies have to handle personal branding of the employees in the future? Dwight Cribb Let people define themselves what they are comfortable with. Give them a clear guideline what company resources and what company information they can use to build their reputation and to what extent they must make clear what is their opinion what the company’s. Q: What do you think of the personal web managers vision? Dwight Cribb There are instances where this makes perfect sense, but I belive they are far and few between. This is a role which has precedence in the offline world, many high-profile business people, politicians and celebrities employ someone with this brief. Whether they do their job online, offline or in both really does not make much difference. We have come to expect that the picture we get presented of these people has been scripted and planned in detail. We even often admire the way in which they craftily manipulate their image. But I think we would be less inclined to condone or accept this level of abstraction in communication in our closer environment of colleagues, family and friends. A facebook status update from a friend loses relevance if I know that it was posted his or her personal web consultant, who was busy making them be liked by their friends and acquaintances. Q: Give us 3 tips how to create a personal brand, please. Dwight Cribb Be yourself, be honest, laugh at times. Thank you for your time and your advice, Mr. Cribb. 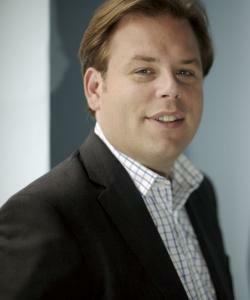 Dell: social media business or the just good marketers? Last week, Dell reported in a blog post that their Twitter account @DellOutlet earned more than $2 million US dollars in revenue. Money that can be attributed directly to their Twitter activity. This does not surprise us, having heard that Dell broke the $1 million US dollar barrier some months ago. Nevertheless, let’s think a minute about the ‘social aspect’ of this Twitter account. The funny thing about it is that Dell is just using old marketing techniques to generate revenue via Twitter. Or is the use of coupon codes a marketing innovation of the web 2.0 era? These couopons come flying into my mailbox at home every day – quicker than I have time to throw them in a bin. Reading this statement, the question is what is the social media strategy? Isn’t this just good old marketing tactics? 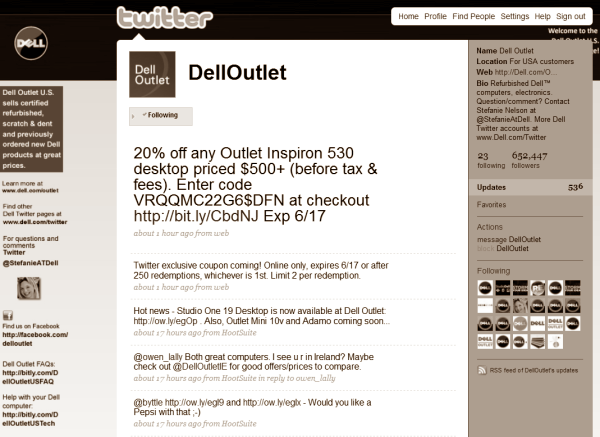 This Dell Twitter account @DellOutlet is not acting in any way like social media has been teaching companies lately. “Listen, learn and engage” (Brian Solis) is the value proposition of social media. The customers are coming to you as they have heard about the quality and value of your product, service or business. Then, they buy and do some good word-of-mouth activity via Twitter, Facebook, blogs, rating sites etc. for your business. This is resulting in community building – not a sales channel like the Dell example. Dell is talking, pushing and selling. It is the good old communication and marketing practice we all know from some years ago. Why is Dell so successful? It is a matter of simple marketing technics. It follows the old sales intelligence… From more than 650.000 followers, 10% will be real followers (as you just follow when you are in the evaluation process mode before a purchase decision) = 60.500 followers. And if you are lucky company 5% will buy your product in the end = 3.025 users. This tells us about an interesting average revenue of 661,15 US dollar per Twitter client. Ah, I love sales statistics… though admittedly, these might be taken from the easiest perspective of ROI measurement. But is this Dell activity really ‘social’? It is the email marketing system – tables turned upside down. Opt-In or follower? Subscribe or unsubscribe is the question… Email promotion or social media promotion? Email spam or social media spam? What comes next in the marketers arena? And, the account is just following Dell accounts… is the client/follower really interesting for them? Not saying this is not a very clever approach reaching out for clients… well-done, Dell. https://thestrategyweb.com/wp-content/uploads/2017/11/strategywebLogo-300x139.png 0 0 The Strategy Web https://thestrategyweb.com/wp-content/uploads/2017/11/strategywebLogo-300x139.png The Strategy Web2009-06-17 08:04:272018-01-26 12:16:42Dell: social media business or the just good marketers?